Leach, a junior, won honorable mentions in the student division for the general news and pictorial categories. Leach chose the photos that were entered in the contest, which was judged by a panel of three experienced professional photographers. Leach said she first became interested in photography while she was a student at Fleming County High School after attending the Washington Youth Summit on the Environment in 2014. While what inspired her to get behind the lens was environmental conservation, she said her motivations have changed since she began taking media classes at MSU. Leach is currently managing editor at The Trail Blazer, MSU’s student newspaper. She began working there as a freshman and plans to apply to be editor this fall. She credits her skills as a photographer to her time working at The Trail Blazer and to the mentorship of the paper’s faculty advisor, John Flavell. 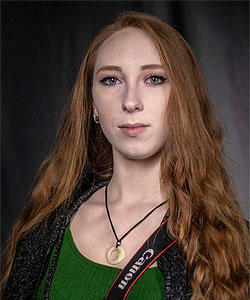 Leach added her minor in photography helped her hone her skills and find her unique photographic style. For more information about The Trail Blazer, visit http://www.thetrailblazeronline.net or call 606-783-2697.